Cubs player Addison Russell has lived a low-key life up until last year. Russell, having been on the team since 2015, won an All-Star title and the World Series in 2016. 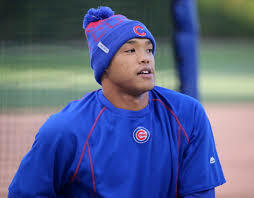 Russell, who is an above average baseball player, is one of the less “showy” players on the Cubs. His name occasionally gets brought up for good plays he has made, and he is not necessarily one of the “faces” of the Cubs. Russell did however make headlines in 2017 and again in 2018 regarding his ex-wife. A friend of Reidy commented on the post, responding to a negative comment towards Reidy, “Hateful is cheating on your wife, mentally and physically abusing her. Melisa didn’t want that out but I’ll say it. He hit her. In front of Aiden and Mila.” Aiden, both Melisa and Addison’s son and Mila, Addison’s daughter from a previous relationship. The post was taken down shortly after the friend’s comments, but it did lead to an investigation from the MLB. Russell was on administrative leave for a few days and the investigation was left open. The two-year marriage of Russell and Reidy officially ended in August in a Florida court. Reidy recently made a blog post, sharing her side of the relationship, speaking out once more. Reidy writes that she forgave him, and “assumed it would never happen again.” She goes on to write that she excused what he had done. “He loves me and he’s sorry.” Reidy writes about specific incidents that occurred of physical and verbal abuse, and how it emotionally damaged her. Reidy said the reason for the blog post is to give herself and other women a voice in situations like hers. “It is not okay for anyone, whoever they may be or whatever title they may have in society to hurt anyone, in any shape or form. I hope my story empowers and inspires other women to stand up for themselves who are going through any type of domestic abuse. Russell, who denied Reidy’s claims in 2017, continues to deny the claims. The MLB put Russell on administrative leave and have investigated the claims once again. Russell’s administrative leave was supposed to last a week. News broke before the end of the leave that it would be extended to the end of the rest of the regular season. Ken Rosenthal reported that the MLB has “additional credible information” that supports allegations by Reidy. Many believe that it is unlikely for Russell to come back to the Cubs organization, but that does not mean he will not play for another team for the 2019 season. Russell may not be the best player on the Cubs, but he could be one of the best on different team. The Cubs are an extremely good team and have been for the last few years. Heading to their fourth consecutive postseason appearance for the first time in franchise history, it is fair to say the Cubs have phenomenal players. On a team that has been struggling, they might pick up Russell. Although he is young, he would be an experienced player that others look up to. Russell would be one of the better players on a struggling team. On a good team, Russell could be the puzzle piece the team was missing. He would be the extra power that the team needs to make it to the playoffs, and possibly the World Series. If Reidy’s claims are true, and it looks like they are throughout this investigation, Russell will probably not return to play for the Cubs, but he will most likely continue playing baseball in the majors. Although Russell was suspended over a weeks’ worth of games, he has been barely punished. MLB teams play 162 each year during regular season. Less than two weeks’ worth of games are nothing. Russell might even be suspended more games at the beginning of next season, but the likelihood of those games really affecting his season will be little to none. Ex-teammate Aroldis Chapman was also involved in a domestic violence incident a few years ago. He was not charged with anything, but he was still suspended 30 games. This short suspension was barely a punishment, and even though Chapman choked and pushed his girlfriend up against a wall and also fired gunshots, the MLB does not care. He was not fired from the majors, he was still able to continue to play baseball professionally. The Cubs picked Chapman up, and after he left the Cubs, he went back to the Yankees. Professional athletes seem to get away with almost everything. You can beat a woman, miss a few games, and still remain having a career where you get paid millions. Situations like this give survivors of abuse more reasons not to speak up. When you speak up, the abuser is barely punished, if punished at all. I am tired of this happening over and over again. Women all over are tired of this repeatedly happening. When is this going to stop? Who is going to stand up and say enough is enough? Who will say that these athletes should never play another game in the pros again? We can hope that this will happen soon, but unfortunately, it looks like this won’t happen for a long time.